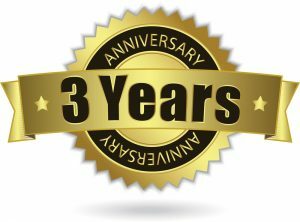 This November is Cookes Storage’s 3rd birthday – and what a fabulous 3 years it has been. In 2015 we opened with a single floor of units, 98 in all. This year we’ve completed our expansion to open our 301st unit. We’ve not only grown in size, we doubled our staff too. But there’s one constant our long term clients will know – Branch Manager Deven. Deven has been part of the Cookes team since we launched, so we asked her about the last three years. Who was the first client? Deven: I’m not sure who was the very first, but one of the earliest is the Marshall Arts Shop, who are with us still. They are experts in martial arts, and sell equipment online and from their shop in Sutton Coldfield. What’s the one thing you can never do without? Deven: My calculator. All of our units are measured in square feet, and that is difficult for many people to picture. I’ve become very good at working with guestimates and converting metres to feet. What else has changed over the years? Deven: Aside from tripling in size, we also opened offices on site. Our resident businesses include Merry Maids and Guardian Office Supplies. And, of course, Andrew moved over from the Cookes furniture store in 2017 as our Director. He’s full of energy, very particular, and he also insists on working the later shifts, so that the rest of the team can go home for the evening. So – tell us about the party! Deven: We’re having a 3rd birthday party on Friday 16th November. Cookes is a local family business, and so we pride ourselves on helping other local businesses. 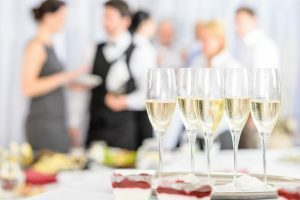 We’re inviting companies we’ve worked with, networked with or who just want to meet us, to celebrate with us and enjoy some relaxed networking at the same time. We’re also having some games, including our top secret Break In Challenge. There’ll be a raffle, and some other fundraising events, for our chosen charities, The Buddy Bag Foundation and Toys4TotsUK. Every party needs a cake and some bubbles. All of the catering will be provided by Edwards Restaurant, so we’re looking at a fantastic afternoon and we hope plenty of businesses will want to join us. 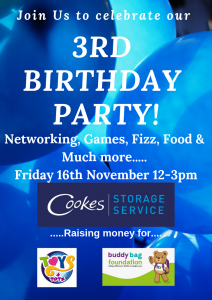 If you would like to celebrate with us this Friday, just email info@cookesstorage.co.uk for the details.